First They Killed My Father (Khmer: មុនដំបូងខ្មែរក្រហមសម្លាប់ប៉ារបស់ខ្ញុំ Moun dambaung Khmer Krahm samleab ba robsa khnhom) is a 2017 Cambodian–American Khmer biographical historical thriller film directed by Angelina Jolie and written by Jolie and Loung Ung, based on Ung's memoir of the same name. Set in 1975, the film depicts 5-year-old Ung, who is forced to be trained as a child soldier while her siblings are sent to labor camps during the Communist Khmer Rouge regime. The film screened at the Telluride Film Festival and 2017 Toronto International Film Festival, and was released worldwide on Netflix on September 15, 2017 to positive critical reception. During the Vietnam War, the United States military begins bombing the neutral country of Cambodia, commencing the Cambodian Campaign. The U.S. then pulls out of Cambodia and evacuates its embassy. An officer of the Khmer National Armed Forces, Ung, known as "Pa" to his seven children, including 5-year-old Loung Ung, expresses regret for having trusted the Americans as the Khmer Rouge draw closer. The Khmer Rouge forces all families to leave the city, under the pretext that it will be bombed by Americans, and join thousands of refugees. Pa Ung denies working for the government when questioned by soldiers, knowing that he will be killed if discovered. The family is found by "Uncle", Pa's brother-in-law, and Loung's family stays with Uncle's family for some time. However, at the insistence of Uncle's wife, who fears the consequences if Pa's identity is discovered, Loung's family has to leave. After days of travel they are rounded up by Khmer Rouge soldiers and taken with other refugees to a labor camp, where they have to build their own shelter and are forced to work under harsh conditions. Their possessions are confiscated, food is scarce as all crops are sent to fighting units, and any attempt to get more food is punished with beatings. Loung is a witness to her siblings' beatings as they try to get more food for themselves and their family. Aside from hard work, the camp preaches the regime propaganda, and any foreign items (including life-saving medicine) are forbidden and carry a death penalty. Loung's two oldest brothers and oldest sister are re-assigned to other camps, and soon afterward her sister dies from sickness and starvation. One day Loung sees Pa taken away by the officials to repair a bridge. Knowing what awaits him, he says goodbye to his wife and children. Later, Loung has a dream in which she sees him executed and buried in a mass grave. Soon afterward, Ma tells Loung, her brother, and her older sister Kim to flee in different directions and seek new working camps under false identities as orphans. Loung and her sister separate from their brother and reach another camp. There, Loung is recruited to be a child soldier for the Khmer Rouge. The Vietnamese have invaded Cambodia, sparking the Cambodian–Vietnamese War. Loung learns hand to hand combat, shooting, and preparation of traps, and works on laying mine fields against the Vietnamese. Children are constantly taught propaganda and hatred of the Vietnamese, but they get more food and are treated better than workers in the labor camps. One day Loung gets a pass to visit her sister in the labor camp, but instead she travels to the camp where her mother and youngest sister were left behind. She finds their hut empty, and an old woman tells her that her family was taken away by the soldiers. That night Loung dreams about her mother lying dead in a mass grave with her youngest sister left next to her corpse to die. Loung's camp is destroyed by Vietnamese shelling, forcing her to flee along with other civilians. On the road she reunites with her brother and sister and stay for a night in a temporary refugee camp managed by Vietnamese troops, where the siblings are joined by a group of children. As the camp is attacked by Khmer Rouge forces in the next morning, they slip behind the defending Vietnamese to escape the fighting into jungle, where Loung is separated from her siblings and witnesses other refugees killed and maimed by the mines that she herself helped set up. The three siblings are reunited in another refugee camp which is run by the Red Cross. There Loung sees people beating a captured Khmer Rouge soldier. She sees him as her father and flashes back to the violence in her life. As she cries out, "Pa", to the man, the aggressors disperse. Loung looks at the beaten man and walks away. As the war ends, Loung and her younger siblings are reunited with their older brothers who also survived the camps. The movie ends with all the children in present time, praying with the monks for their lost family members at the ruins of a Buddhist temple. The film uses Cambodian actors and filmed in the Khmer language of Cambodia. On July 23, 2015, it was announced that Angelina Jolie would next direct a film adaptation of the memoir First They Killed My Father by Loung Ung for Netflix, for which Jolie and Ung co-wrote the script. Jolie would also produce the film along with Rithy Panh, while Jolie's son Maddox Jolie-Pitt would be an executive producer. Principal photography on the film began in early November 2015 in Siem Reap and wrapped in February 2016 in Battambang, Cambodia. Filming also took place in Phnom Penh. On review aggregator website Rotten Tomatoes the film has an approval rating of 88% based on 65 reviews, with an average rating of 7.8/10. The site's critical consensus reads, "First They Killed My Father tackles its subject matter with grace, skill, and empathy, offering a ground-level look at historic atrocities that resonates beyond its story's borders." Metacritic, another review aggregator, assigned the film a weighted average score of 72 out of 100, based on 22 critics, indicating "generally favorable reviews". Matt Zoller Seitz of RogerEbert.com gave the film four out of four stars, stating that it was Jolie's best work as a director yet, made without any compromise to its "journalistic" storytelling. He noted that "[t]he ace in Jolie's deck here is the knowledge that a girl as young as Loung can't comprehend the larger meaning of what's happening to her, and is therefore unlikely to expend precious emotional energy connecting cause-and-effect dots or lamenting what was lost. It's an almost entirely experiential movie." He later named it the second best film of the year, behind Lucky, stating that it is "[o]ne of the greatest films about war ever made, as well as one of the best films about childhood.... I can't imagine a frame of this film being better, only different." The film was selected as the Cambodian entry for the Best Foreign Language Film for the 90th Academy Awards, but it was not nominated. It was the first time a prominent American director's non-English film was submitted since the Academy set a rule in 1984 that a country's submission has "artistic control" from a "creative talent of that country"; Jolie has dual citizenship with the U.S. and Cambodia. ^ Craddock, Kerri (September 2017). "First They Killed My Father". Retrieved 19 September 2017. ^ Debruge, Peter (3 September 2017). 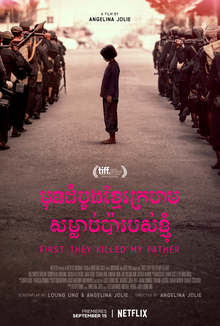 "Telluride Film Review: 'First They Killed My Father: A Daughter of Cambodia Remembers'". Variety. Retrieved 19 September 2017. ^ Hunter, Allan (13 September 2017). "'First They Killed My Father': Toronto Review". ScreenDaily. Retrieved 19 September 2017. ^ Sims, David (15 September 2017). "First They Killed My Father Is a Surprising, Devastating Triumph". The Atlantic. Retrieved 19 September 2017. ^ a b Patten, Dominic (23 July 2015). "Angelina Jolie To Helm 'First They Killed My Father' As A Netflix Original Pic". Deadline Hollywood. Retrieved 27 July 2015. ^ "EXCLUSIVE: First look at the set of Angelina Jolie's new film in the heart of the Cambodian jungle". Daily Mail. 7 November 2015. Retrieved 12 November 2015. ^ Lew, Josh (9 November 2015). "Angelina Jolie to Start Filming in Cambodia's Biggest Tourist Attraction". TravelPulse. Retrieved 12 November 2015. ^ "First They Killed My Father (2017)". Rotten Tomatoes. Fandango. Retrieved 16 September 2017. ^ "First They Killed My Father reviews". Metacritic. CBS Interactive Inc. Retrieved 18 March 2019. ^ Seitz, Matt Zoller (15 September 2017). "First They Killed My Father Movie Review (2017)". RogerEbert.com. Ebert Digital LLC. Retrieved 18 September 2017. ^ Frater, Patrick (18 September 2017). "Cambodia Sets Angelina Jolie's 'Father' as Oscar Contender". Variety. Retrieved 18 September 2017. ^ Tartaglione, Nancy (1 December 2017). "Oscars 2018: Weighing The Early Best Foreign Language Film Race". Deadline Hollywood. Retrieved 5 December 2017. ^ "Bafta Film Awards 2018: All the nominees". BBC. Retrieved 9 January 2018. ^ "CAMERIMAGE 2017 WINNERS!". Camerimage. Retrieved 30 November 2017. ^ "Nominations 2018". Cinema for Peace Foundation. Retrieved 2018-02-22. ^ Kilday, Gregg (6 December 2017). "Critics' Choice Awards: 'The Shape of Water' Leads With 14 Nominations". The Hollywood Reporter. Prometheus Global Media, LLC. Retrieved 7 December 2017. ^ Maglio, Tony (11 December 2017). "Golden Globes 2018: The Complete List of Nominees". The Wrap. Retrieved 11 December 2017. ^ Hammond, Pete (5 November 2017). "Hollywood Film Awards Steers Away From Scandal And Keeps Its Eye On The Prizes To Winslet, Gyllenhaal, Oldman And More". Deadline Hollywood. Retrieved 4 December 2017. ^ "2017 Award Winners". National Board of Review. Retrieved 30 November 2017. ^ Staff (28 December 2017). "Get Out Wins Big at Online Film Critics Society Awards". Den of Geek. Retrieved 30 December 2017. ^ Pond, Steve (29 November 2017). "'Dunkirk,' 'The Shape of Water' Lead Satellite Award Nominations". The Wrap. Retrieved 2 December 2017. ^ "Women's Image Network announces its 19th Women's Image Awards Film and Television Nominees". Women's Image Network. 10 November 2017. Retrieved 5 December 2017.